Earlier in the year, upon the recommendation of someone I follow on Twitter (and subsequently Richard and Judy) I read ‘Eeny Meeny’ by M J Arlidge. It introduced us to DI Helen Grace (I imagine her as a slightly younger, feistier and even more messed up Jane Tennison / Helen Mirren!) and her crime fighting in Southampton (where I went to University – so I always feel an allegiance to the city / football team) It was a fast moving, graphic, chilling thriller – and I LOVED it! 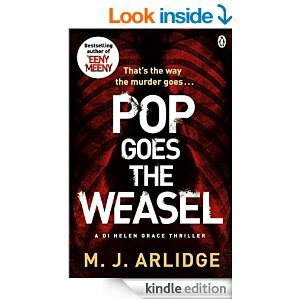 I immediately pre-ordered the sequel ‘Pop Goes The Weasel’ and it magically appeared on my Kindle last week. “A man’s body is found in an empty house. His heart has been cut out and delivered to his wife and children. He is the first victim, and Detective Inspector Helen Grace knows he will not be the last. But why would a happily married man be this far from home in the dead of night? The media call it Jack the Ripper in reverse: a serial killer preying on family men who lead hidden double lives. You don’t have to have read ‘Eeny Meeny’ to read this – but, this has loads of spoilers in it explaining things that happened in the first book, so you couldn’t go back and read the first one afterwards without knowing lots about how it would conclude. Again I raced through this, really enjoying the fast pace. The chapters are often quite short – so ‘just one more’ happens a lot (and before you know it, it’s 1am and you should have turned the light out hours ago!) I have to say I guessed who the killer was pretty early on this time around – although not all of the twists and turns that went with the story. It was also quite stressful to find the suburb I lived in 20 years ago, Portswood, being described as the red light district – and that students from my University were being forced into prostitution to pay uni fees!! Having just read up a bit about the author, he has worked in TV for years – and I think that’s quite apparent from the scene setting and excellent descriptions of the areas and characters (surely someone will buy the TV rights for this?) This is gory – and you need a strong stomach for some of it – but it’s worth it. Yet again I’m left wanting to find out what happens to DI Grace and the team next – roll on 12 February 2015 when the final book in the trilogy ‘The Doll’s House’ will hit my Kindle. Suspect it won’t be the perfect Valentine’s read! !